Furfural is a valuable chemical compound. It is a clear, colorless motile liquid having a characteristic almond-benzaldehyde odor. Furfural is also known as 2-furancarboxaldehyde, furaldehyde, 2-furanaldehyde, 2-furfuraldehyde, fural, and furfurol. Its molecular formula is C5H4O2. Furfural is produced from agricultural waste biomass that contains pentosans, which are aldose sugars composed of small rings formed from short, five-member chains. These aldose sugars constitute a class of complex carbohydrates. Raw materials used in the manufacture of furfural are obtained from woody plants; for example, corn cobs, sugarcane bagasse, and rice and oat hulls. Furfural is one of the platform chemicals that can be used as a starting reagent to produce other high-value-added products and that can be produced from different lignocellulosic residues including those obtained from agricultural activities. Furfural is used as a solvent in refining of lubrication oils, extraction of butadiene, and chemical extraction processes of different types. Demand for furfural for the use in binding refractory materials and resin-bonded grinding wheels is high due to its excellent physical properties. Rapid growth of the construction industry is expected to augment the demand for furfural for the use in various refractory materials such as fiberglass composites, bricks, and ceramics in the near future. Depletion of fossil fuel resources is driving the demand for sustainable products. This, in turn, is boosting the demand for furfural worldwide. Furfural is produced by using processes such as Quaker batch process, Chinese batch process, and Rosenlew continuous process. Feedstock is mixed with sulfuric acid, after which it is reacted in a rotating spherical at 153°C, while being sparged with superheated steam in the Quaker batch process. Furfural formed by using this process is separated by passing steam through the bed. The process continues for a few hours, after which it is stopped and the residue is let down from the digester. Steam and furfural vapors extracted from the digester are then condensed and separated with the help of decanting and distillation. The digesters in the Chinese process do not rotate. They consist of large cylinders in which steam, at 5 bars pressure, is passed through a static bed 1.5 m diameter and 8 m tall. In this process, the size of the corn cobs is between 20 to 30 mm. In terms of application, the furfural market has been segmented into furfuryl alcohol, solvents, pharmaceuticals, chemical intermediates, and others. The furfuryl alcohol segment accounts for a dominant share of the furfural market. Furfuryl alcohol is used in the production of furan resins, surface coatings, mortar, specialty polymers, chemically resistant resins, and adhesives used in foundry cores and molds. Currently, furfuryl alcohol is used primarily in binders for traditional furan no-bake systems. It is employed in furan hot-box, warm-box, and gas-hardened processes in less quantity. The chemical intermediates segment accounts for a significant share of the furfural market. Furfural is used to manufacture tetrahydrofuran (THF), which is precursor for a wide range of chemical syntheses. Furfural is a raw material used for polytetramethylene ether glycol (PTMEG). The others segment includes pesticides, herbicides, and flavoring agents. Furfural is used in the manufacture of the 5-methyl furfural, which is a high-value flavor compound. Based on region, the global furfural market has been divided into North America, Europe, Asia Pacific, Latin America, and Middle East & Africa. In terms of both revenue and volume, Asia Pacific dominated the global furfural market in 2017. Low manufacturing costs, increase in disposable incomes, and availability of raw materials in Asia Pacific drive the market in the region. China holds a major share of the market in Asia Pacific owing to growth in the metal casting industry in the country. China is a key exporter of furfural. It exports the chemical compound to the U.S. and countries such as Japan, Belgium, Singapore, and South Korea. Europe accounted for a large share of the furfural market in 2017. The market in the region is likely to expand at a sluggish pace in the next few years primarily due to slow economic growth. Demand for furfural in North America and Middle East & Africa expanded at a moderate pace in last few years. The trend is expected to continue in the near future. The furfural market in Latin America is likely to expand at a sluggish pace during the forecast period due to less demand from various end-user industries. Key players operating in the global furfural market are focusing on capacity expansion and mergers. This, in turn, is likely to propel the market during the forecast period. Key manufacturers operating in the furfural market include Central Romana Corporation, Ltd., Hongye Holding Corporation Ltd., Illovo Sugar Ltd., Lenzing AG, Penn A Kem LLC, Silvateam S.p.A., Tanin Senvica d.d., Aurus Specialty Company, Henan Huilong Chemical Co., Ltd., Shandong Crownchem Industries Co., Ltd., and Tieling North Furfural (Group) Co., Ltd.
Furfural is a liquid chemical produced from biomass. Furfural is extensively utilized as a solvent during the manufacture of refractory materials, resin-bonded grinding wheels, and butadiene extraction due to its superior physical properties. This, in turn, is boosting the demand for furfural in solvents. Furfural acts as a platform for the production of biofuels and biochemicals. It is a source of natural precursor to a wide range of furan-based chemicals and solvents such as methylfuran, furfuryl alcohol, tetrahydrofurfuryl alcohol, tetrahydrofuran, methyltetrahydrofuran, dihydropyran, and furoic acid. Furfural is primarily used in the production of furfuryl alcohol. Furfural is also used as a solvent in lubricating oils and butadiene extraction, and as an intermediate in other applications. Demand for furfuryl alcohol is high in the metal casting industry. It is utilized to manufacture various automobile parts and industrial machineries. Furfuryl alcohol is primarily employed in resins, which are used as binders in the foundry industry. Furfuryl alcohol provides superior binding properties and mechanical strength, which is required in sand molds and cores in foundries. Rising demand for metal-casting products in the automotive industry and industrial equipment is driving the global furfuryl alcohol market. Furfural is also used as a solvent in various industries including pharmaceuticals, lubrication oils, and in extraction processes. In terms of volume and revenue, the solvents segment accounted for a large share of the furfural market. Increasing concerns regarding the limited availability of fossil fuels has increased the demand for renewable resources. Furfural is derived from biomass, which is a renewable resource. Hence, demand for furfural is expected to rise significantly in the near future. Globally, furfural is manufactured through three commercial methods; however, neither of these methods are efficient as they yield less than 50%. These inefficient and low-yield production methods have led to high product cost. This inhibits the global furfural market. Innovative production methods with improved yields are likely to provide large opportunities in the furfural market in the near future. In terms of volume, Asia Pacific dominated the global furfural market, accounting for a share of more than 60% in 2017. 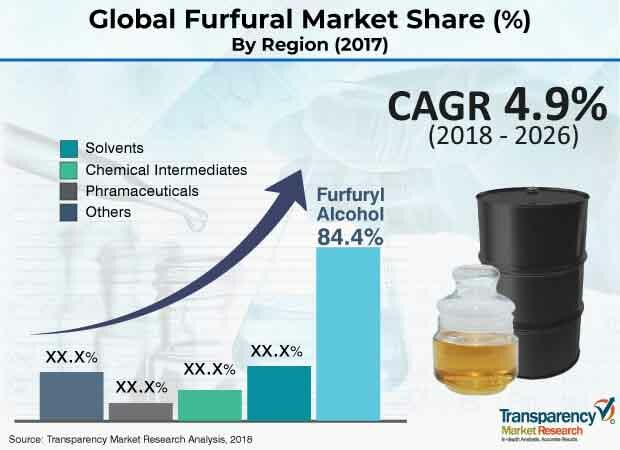 The furfural market in Asia Pacific is driven by the rapid growth in application industries such as furfuryl alcohol, solvents, and pharmaceuticals. Developing economies such as India, China, and those in ASEAN are estimated to be major markets for furfural during the forecast period. Europe held a large share of the furfural market in 2017. However, demand for furfural in Europe is expected to be sluggish due to high cost and slow economic growth. Demand for furfural in North America, Latin America, and Middle East & Africa was moderate in 2017. The trend is likely to continue during the forecast period primarily due to high cost and limited commercial application. The report analyzes and forecasts the furfural market at the global and regional levels. The market has been projected in terms of volume (tons) and value (US$ Thousand) for the period from 2018 to 2026. The study includes drivers and restraints of the global furfural market. It also encompasses the anticipated impact of these drivers and restraints on the demand for furfural during the forecast period. The report highlights opportunities in the market at global and regional levels. The report comprises detailed value chain analysis, which provides a comprehensive view of the global furfural market. The Porter’s Five Forces model for the furfural market has also been included to help understand the competition landscape of the market. The study encompasses market attractiveness analysis, wherein application segments have been benchmarked based on their market size, growth rate, and general attractiveness. The study provides a decisive view of the global furfural market by segmenting it in terms of application and region. These segments have been analyzed based on the present and future trends. Regional segmentation includes the current and forecast demand for furfural in North America, Europe, Asia Pacific, Latin America, and Middle East & Africa. The report also covers individual application segments of the market in every region. The study includes profiles of major companies operating in the global furfural market. Key players profiled in the report on the global furfural market include Central Romana Corporation, Ltd., Hongye Holding Corporation Ltd., Illovo Sugar Ltd., Lenzing AG, Penn A Kem LLC, Silvateam S.p.A., Tanin Senvica d.d., Aurus Specialty Company, Henan Huilong Chemical Co., Ltd., Shandong Crownchem Industries Co., Ltd., and Tieling North Furfural (Group) Co., Ltd. Market leaders engage in strategic pricing and product improvement to increase their profit margins. The report provides size (in terms of volume and value) of the global furfural market for the base year 2017 and the forecast period between 2018 and 2026. Market numbers have been estimated based on application and region. Market size and forecast for each application segment have been provided for the global and regional markets.